BT Halo integrates with up to two mobile phones and its screen shows which mobile phone a call has been forwarded from. The contact lists from both mobiles are also copied across to Halo, ensuring customers always have their contacts to hand. The new easy-to-use BT Halo combines performance with an elegant design and has been created in collaboration with an award-winning UK design agency. It has a distinctive look that combines contemporary design with high spec features and performance. Designed to fit the shape of the human face, the proportions and curvature of the handset makes the BT Halo comfortable to hold for long conversations. The increased length of the handset sits naturally in the hand and the soft rubber ring around the ear piece gives both comfort and improved audio performance. Aluminium finishes give the phone a quality feel and provide superb sound quality. The new BT Halo comes with BT’s Premium Nuisance Call Blocking technology, which allows customers to block up to 100 per cent of unwanted calls made to their landline number. It does this by screening incoming calls to the landline so users never have to speak to a cold caller again. Callers on the contact list get straight through, anyone on the blocked list is blocked, and everyone else has to announce their name before the customer answers it. Customers can then choose to accept or block the announced calls and the phone learns over time who the customer wants to speak to and who they don’t. The BT Halo has all the features of a BT home phone including an answer machine that can record up to 60 minutes of messages, hands free capability, and a backlit keypad. It also has a range from the handset to the base unit of up to 50m indoors and 300m outdoors, and the capacity to store up to 3,000 contacts. The BT Halo is available at www.bt.com/shop. The single unit is £99.99 and the BT Halo Twin is £139.99. Synchronise your mobile contacts to your home phone. Pair two mobile phones at any one time (up to 1,000 contacts each). Make and receive mobile calls from your home phone. Dedicated call blocking button for one touch blocking. Block up to 100 per cent of Nuisance Calls. Block up to 1,000 numbers or block calls by type. Customisable call blocking settings giving complete flexibility. Block common nuisance call types e.g. International, Withheld, Unavailable. Award winning trueCall blocking technology. Auto copy contacts between handsets. Record up to 60 minutes of messages. Outgoing call controls (PIN protect calls to premium / mobile numbers). Backlit keypad for easy dialling even in poor light. Long range reception up to 300m outdoors, 50m indoors. Up to 21 hours of talking and 240 hours on standby. Easy access to BT calling features (three way calling, call divert). 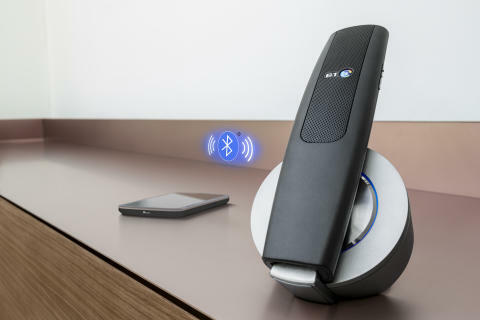 To use BT Halo to make and receive mobile calls you will need to have your mobile located so that it gets mobile reception and is close enough to your landline base for Bluetooth connectivity. Bluetooth range is around 10m. All calls not on the customer’s contact list are screened. Those on the blocked list are blocked. The remainder have to announce their name, giving the user the chance to block 100% of nuisance calls without having to speak to them. Calls coming through a synchronised mobile phone are not blocked.